M17, the Omega or Swan Nebula, is a region of star formation and shines by excited emission, caused by the ultraviolet light radiation of young stars which have formed inside the nebula. The main light contribution to the nebula comes from the hydrogen alpha line at 656.3 nm, which causes to nebula to appear in a red color. The pink and nearly white colors near the center are caused by a mixture of emission by the hydrogen and reflected starlight by the dust within the nebula. M17 contains a large amount of dark obscuring material, which is obvious in its remarkable features. The mass of the gas has been estimated to amount about 800 times that of the Sun, more than the famous Orion Nebula M42. While the bright nebula seems to be roughly 15 light years in extension, the total gaseous cloud, including low-luminosity material, extends to at least 40 light years. Modern distance estimates place the nebula at about 5.000 to 6.000 light years. M17 was discovered by de Cheseaux in 1764, and Charles Messier independently observed it and listed it in his famous catalog in the same year. 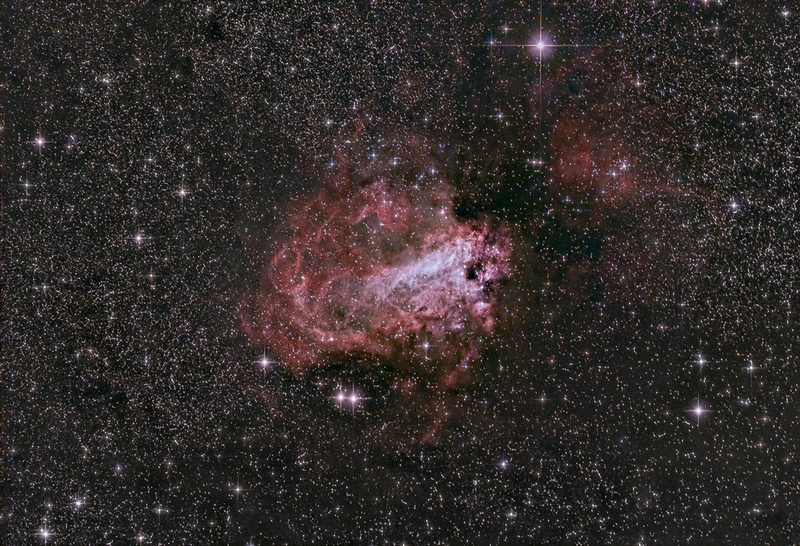 In 1893, Isaac Roberts took the first known photograph of M17 with a 20 inch reflector in a two-hour exposure. Notes: My first try with the Alpha Tauri 2000/1000 Newtonian and the ZWO ASI camera. Somewhat bloated stars caused by bad seeing and main mirror shifting.